Normally, most users are used to selecting a cooling fan or blower by referring to maximum flow rate, maximum static pressure and rotational speed data in product specification. It’s not a complete thinking, because the fan is always working inside the system. Y.S. TECH has to highly recommend you to focus on demanded operating point works in fan performance curve profile, do not only refer the maximum point or rotational speed. Meanwhile, a cooling requirement should not only regard flow rate or static pressure, but two key factors of power consumption and acoustic noise. However, these critical factors are trade-offs, so how do we select a right fan to meet with thermal solution? 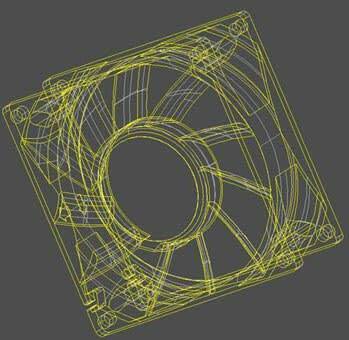 We are going to illustrate you some methods how to select a right fan in the following content. And then we will discuss other important technical topics including: Life (L1O), RoHS and Application Note. Watt: How many watts would you need to dissipate? Air Impedance: What is your system air-impedance? Noise: What is acoustic noise specification you need? Temperature Gradient: What is your design of T? Dimension: What is fan dimension you need? Choose a right fan & blower to meet your thermal inquiry . The effects of heat transfer include Conduction, Convection and Radiation. 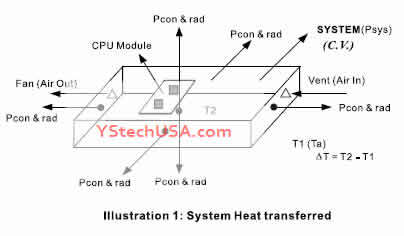 Most heat transfer by conduction and radiation effects that concern about system mechanism. For example, a good chassis or heat sink design is more helpful for thermal solutions. Convection effects contain free convection and forced convection. Cooling fan and blower are the major effect for force convection and always increase entire thermal solutions more efficient. Illustration 1 (below) shows you a normal system of heat dissipation status. presents heat dissipation on free convection and Radiation transfer. p. presents total power consumption of system. P,., presents forced convection that need cooling fan or blowerto dissipate. T presents Temperature GradientT = T2 – T, T2 is the thermal spec of critical parts with margin tolerance T1presentsAmbient Temperature. Illustration 2 shows two fans performance curve and system air impedance curve. Even B’s maximum flow rate is higher then A’s but the Qop_A better than Qop_B. Both Qop_A and Qop_B are Operating Points.